Last look at the party before the Spitfire and Lancaster arrive. 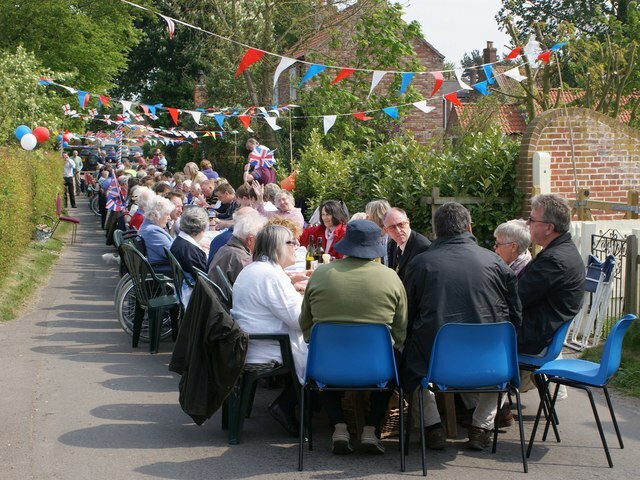 A street party was held by the residents in the royal village of Old Bolingbroke (Henry of Bolingbroke was born here, at Bolingbroke Castle, in 1366 and at the age of 34 was crowned Henry IV, King of England) in celebration of the Royal Wedding of Prince William and Miss Catherine Middleton. Coincidentally, it just happened to have been held in the Census year of 2011, so it was fitting to see and photograph so many of the villagers together in one place. The weather was kind, with sunshine throughout, but the village hall had been reserved just in case the rain came. Funding was generously provided by those that could, and by the Parish Council itself, the Festival of Bolingbroke: Friends of Bolingbroke Castle and many of the suppliers for the day. Highlights were two fly-bys each, both provided by the Battle of Britain Memorial Flight's Lancaster and one of the Spitfires, which had over-flown Buckingham Palace, following the wedding. Another was music, which was provided by Mareham-le-Fen Victory Silver Band. There was also entertainment for the children; bobbing for donuts, egg painting and for adults and children alike, a tug-of-war, which was held in the grounds of The Laurels - thanks to David and Carol Frazer. A record of the events was taken by both BBC Look North and Radio Lincolnshire and put out on the news. Huge thanks go to Kathy Cartwright, Linda Creedy, Jo Franklin, Carol Frazer, Pam Powell, Adrian Ellis and Avril Wilson as well as many others who helped behind the scenes. The full-sized photographs are available from me. This page has been viewed about 642 times. "PARISH EMERGENCY PLAN/DIRECTORY for Parish Councils in the district of EAST LINDSEY DISTRICT COUNCIL. PERSON RESPONSIBLE FOR THE PLAN: Mrs Wendy Done (Clerk). (a) Moat Lane – Beck prone to overflowing vicinity of The Watermill. (b) Back Lane - Beck prone to overflowing vicinity of Normandy Farm. (c) Hagnaby Road – Dykes in Hareby Lane and Hagnaby Road prone to flooding from near the junction of Hareby Lane southwards to Kings Court. (d) Horncastle Hill – Flooding can occur at the foot of hill near the War Memorial which contributes to the problem at c) above. (e) West Keal Road – Flooding can occur at the foot of the hill in the vicinity of Holly Cottage. (f) Hagnaby Road – Dykes in the vicinity of Glebe Cottage prone to overflowing." I haven't been able to verify the number of houses flooded, but was told, "three or four", which isn't an accurate figure. It could be three, four, more, or even less. It was 'severe' as far as the village is concerned because it doesn't happen very often - four times since 1986. I was there during every occasion and 1986 could probably be described as being the worst. Crops were washed out of the fields and tree branches could be seen floating down this road. On another occasion the flood water lifted huge chunks of road, about 150mm thick at the junction of Back Lane and Hagnaby Road, which made it impassable. In my opinion, the people buying into the village have more rights than the people wishing to leave, so the photographs should not be censored.